During September, Simms will offer a limited edition T-Shirt (available in Men’s and Women’s) designed by Jorge Matinez, a Florida native who grew up just north of Everglades National Park. Martinez is an avid angler and passionate conservationist. 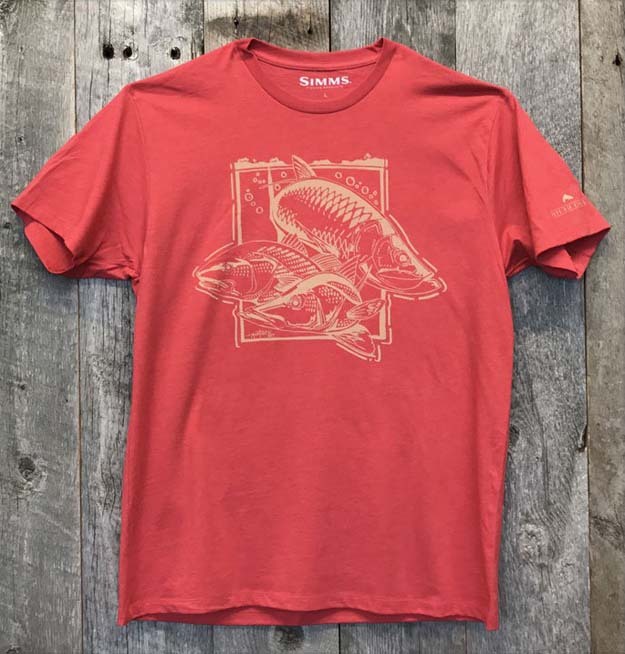 A portion of every T-Shirt sale available through Simms’ retail partners and will benefit Captains for Clean Water, a non-profit organization that spawned from a group of fishing guides based out of Fort Myers, Florida, who “had enough” of Florida’s poor water management practices. Captains for Clean Water fights to eliminate harmfully, large-scale Lake Okeechobee discharges into the Caloosahatchee and St. Lucie River estuaries by restoring the natural flow of Lake Okeechobee, sending its water south, back into the Everglades and Florida Bay. Healthy rivers not only are vital for thriving fisheries and great angling opportunities, but they also sustain diverse wildlife, contribute billions of dollars annually to our outdoor recreation economy, and they’re the main source of drinking water for two-thirds of Americans. In short, we can’t live without them. Jorge Martinez’ Everglades S. O. S. Tee. The labyrinth of mangrove forests, sawgrass marshes, and cypress swamps are known as the Everglades is one the most diverse and unique fisheries in the country. For decades, anglers have been drawn to not only the tarpon and snook that reside here but also to the mystic and lore of this South Florida jungle. This 2 million acre wetland begins in Central Florida’s Kissimmee River and flows south into Lake Okeechobee. Historically, during the wet season, Lake Okeechobee’s overflow formed a slow moving river of grass that flowed south through Everglades National Park, all the way out to Florida Bay. Water mismanagement in the form of damming, ditching and draining, has drastically changed the traditional flow of fresh water that once supplied, and balanced the Everglades. To protect this one-of-a-kind resource, we have to send the water south again. About Simms Fishing Products: Established in 1980, Montana-based Simms is the Preeminent manufacturer of waders, outerwear and technical apparel in fishing. The full line of Simms gear is available at specialty and large format retailers nationwide as well as www.simmsfishing.com. The S.O.S. Everglades “River of Grass” joins Bristol Bay, Henry’s Fork, Smith River, Boundary Waters, and Yellowstone.